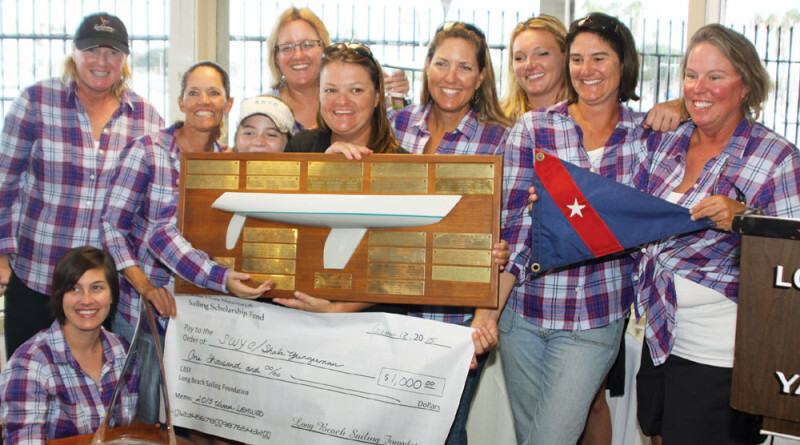 LONG BEACH — Shala Youngerman and her Southwestern Yacht Club team became back-to-back two-time winners Oct. 25 in the 24th annual Linda Elias Memorial Women’s One-Design Challenge fleet race, organized and sponsored by Long Beach/Los Angeles Women’s Sailing Association and hosted by Long Beach Yacht Club. Raced on the Long Beach Sailing Foundation’s fleet of Catalina 37s, nine West Coast teams from Seattle, Wash. to San Diego, Calif. ran the two-day regatta under sunny skies and consistent breeze… except when there wasn’t any breeze. Saturday, Oct. 24 dawned overcast but the clouds began parting ahead of the noon start time and all was well with southwest breezes of 8 to 13 knots, allowing teams to get in all four of the scheduled races for the day. Sunday was a bit more of a challenge with cloudy skies and a half-hearted breeze started to fill in but all but evaporated halfway through Race 5. After a delay of about an hour the wind returned, but not in time to get the full three scheduled races in before the mandatory cut-off time for starting races. Youngerman credits her team giving her the opportunity to win this regatta for a second time. Her team included Sara Williams, Jessica Amen, Kati Morton, Tracy Nackel, Tammy Fowels, Sandra Sherman, Marni Buddo, Jenn Garver (team captain), Summer Green and Heidi Taylor. Youngerman didn’t get the start she wanted in the first race Oct. 24, finishing in third. But after that, she posted three first place finishes to end the day with Long Beach YC co-skippers Lisa Meier and Wendy Corzine only three points behind. As Sunday’s breeze struggled, so did many of the teams with the ever-lightening and shifty conditions. Youngerman finished the day with two fourth-place finishes. Meier and Corzine had challenges in race five getting an eighth place finish, but came back in the final race with a first. Youngerman won the regatta four points ahead of Meier and Corzine who were able to hold on to second place on a tiebreaker with Karen Jones and her team from the Santa Monica Bay Women’s Sailing Association. Youngerman, once again, was awarded the perpetual Linda Elias Memorial Women’s One-Design Challenge trophy, the Catalina 37 Women’s One-Design Challenge, LB/LA Women’s Sailing Association trophy and she also received a $1,000 scholarship check from the Linda Elias Sailing Scholarship. The Women’s One-Design event began 24 years ago. Linda Elias passed away in 2003 and the Long Beach/Los Angeles Women’s Sailing Association rededicated the event to her memory. Complete results are available at lbyc.org.